James Thomas Byford McCudden VC, DSO & Bar, MC & Bar, MM (28 March 1895 – 9 July 1918) was an English recipient of the Victoria Cross, the highest award for gallantry in the face of the enemy that can be awarded to British and Commonwealth forces. McCudden was the most highly decorated British Empire pilot of the First World War and one of the longest serving, having joined the Royal Flying Corps in 1913. McCudden's story is all the more remarkable as he rose though the RFC ranks (from Air Mechanic to Major) during the war to become one of the most decorated soldiers of the conflict. 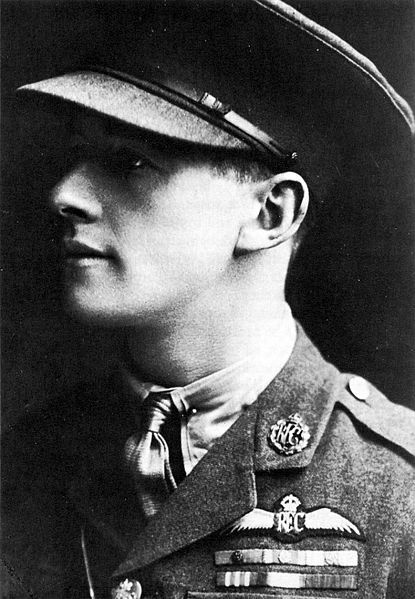 At his death he had amassed 57 victories, making him the seventh highest scoring ace of World War I.
James McCudden was born in Gillingham, Kent to ex-Sergeant-Major William H. McCudden and his wife Amelia of "Pitlochry", 37 Burton Road, Kingston-on-Thames, London. Two of his brothers Willie (killed in 1915) and Jack (killed in 1918) were also military pilots. He joined the Royal Engineers in 1910, but after a flight with his brother Willie across Salisbury Plain requested transfer to the RFC, which was granted in 1913. In August 1914 he went to France as a mechanic with No. 3 Squadron, and was allowed to fly as an observer over the next few months. In January 1916 he returned to England, learned to fly at Gosport, and obtained his pilot's licence in April 1916. He joined No. 20 Squadron as an NCO in June 1916 flying the FE-2 from Clairmarais, near St Omer. After just a month he soon switched to 29 Squadron flying DH-2 scouts. He made his first claim for an aircraft in September 1916. Sgt McCudden and several of 29 Squadron encountered Jasta 2 and Leutnant Manfred von Richthofen in a prolonged dogfight on the 27th December 1916. The Baron claimed a 'pusher' shot down during this fight, and research seems to indicate it was McCudden's DH-2 he claimed, although none of the 300 bullets fired by the Baron had even hit McCudden's machine and he returned safely to base. By February 1917 McCudden had received the Military Medal, been granted a commission and awarded the Military Cross. He returned to the UK having claimed 5 air victories. During this spell, McCudden was twice involved with attempted intercepts of formations of bombers in a phase of Gotha Raids. In the second raid on 17 July 1917 on London, out of a defending force of 95 aircraft, McCudden alone was able to achieve sufficient altitude in his Pup to engage the enemy. Having insufficient ammunition, he was unable to make any significant impact. After a spell with 66 Squadron on Sopwith Pups, he was appointed as a flight commander with 56 Squadron, flying SE5as in mid 1917. McCudden was one of the first truly 'professional' airmen, who applied a scientific approach to air combat. McCudden took great pains over his guns, aircraft, and tactics, dismissing choices of last resort such as crashing your plane into the enemy just to get a kill. Using his knowledge as a mechanic, he effectively supercharged his aircraft to give it an additional 4,000ft altitude ceiling. This resulted in him specialising in carefully stalking high altitude reconnaissance aircraft, leading to an unsurpassed total of captured enemy aircraft kills (21 fell within Allied lines). Some of these stalking techniques are described in McCudden's autobiography, entitled "Flying Fury - Five Years In the RFC". Unlike the German and French governments, the War Office had up to 1917 been reluctant to identify individual soldiers and 'aces' for propaganda and public morale purposes. However, from December 1917 after Viscount Northcliffe was placed in charge of the Ministry of Information, he felt an advantage was being missed, and so ran a campaign in his publications to name outstanding individual combatants. On January 3, 1918 he ran a story in the Daily Mail under the headline "Our Unknown Air Heroes," which focused on McCudden. Shying away from this publicity, McCudden didn't even tell his family of his attendance at Buckingham Palace to receive his Victoria Cross from King George V. McCudden was also awarded his DSO and bar and a bar to his Military Cross at the same time. Promoted to the rank of Major, while on leave in London he socialised a great deal with Edward Mannock. The friends ended up competing for the love of West End theatre dancer Teddie O'Neill, whom McCudden took on a joy ride, but also commented in Mannock's diary "Hell hath no fury like a woman scorned", following it rather enigmatically with the word "Piffle!" McCudden wished to return to the front, but because he was now a high-profile celebrity the Air Ministry was not keen. McCudden eventually won this discussion, but was reportedly turned down for command of No. 85 Squadron RAF because of his lack of a public school education for service. "The General came over and had tea with us and asked who we wanted as CO. He wanted to send us McCudden but we don't want him. He gets the Hun's by himself but he doesn't give anybody else a chance at them...We asked for Mickey Mannock who is a flight commander in 74 Squadron." Accepted for command of No. 60 Squadron RAF, he collected his new Royal Aircraft Factory S.E.5a outside London and flew to Kent to spend the night with his family. Having had breakfast with his sister, on 9 July 1918 he flew over the English Channel towards Boffles, France. He landed at Auxi-le-Château, France, to get directions from the RAF personnel stationed there. Shortly after takeoff from Auxi-le-Château, the S.E.5a's engine failed, possibly due to a wrongly installed carburettor, and the aircraft crashed. The incident happened within sight of RAF personnel, who quickly drove over to render assistance. McCudden was found at the crash site with severe multiple injuries, including a fractured jaw. He was taken to hospital where he died two hours later, without regaining consciousness. McCudden's remains were subsequently buried at the nearby Wavans war cemetery in the Pas de Calais. McCudden's death occurred only two months after the death of German ace Manfred von Richthofen, whom some commented had been honoured with a longer and more elaborate funeral by the British. McCudden's wartime score was 57 victories (third highest among RFC / RAF pilots) included 19 captured, 27 and 1 shared destroyed, 8 and 2 shared 'down out of control'. Unlike many of his fellow aces, the majority of his claims can be verified from Allied and German sources, suggesting McCudden may in actuality have been the top scoring RFC / RNAS / RAF pilot of the conflict, and the top British flying ace of all time.